What exactly is Microcurrent Technology? Microcurrent services and encouraging ATP (adenosine triphosphate) to enhance collagen and elastin production are what everybody is talking about today. It can be found in age management magazines, in fashion articles that feature skin care, and on just about every website you visit there is discussion about boosting levels of collagen and elastin and equally important, retaining that which we possess. Moreover, we are hearing much more about microcurrent in marketing materials at large and some product companies claim to have "microcurrent particles" within their product. Interesting...., yes. In skin care microcurrent is a buzzword, no doubt. An analogy that can be made with respect to microcurrent and skin health is the correlation to fitness and the benefits of exercising the body. We know that through exercise we can increase our sluggish metabolism by working the exercise program. Secondly, by working a muscle it becomes strengthened . Finally, by stimulating circulation through improving cardiac functions, we decrease inflammation and ultimately increase stamina and energy. The same is true for our skin; by being consistent with our skin care habits we can protect, stimulate, and maintain our skin's beauty, function, and longevity. Microcurrent is an extremely low level of electricity that mirrors the body's own natural electrical rhythms. Microcurrent acts as an external source of energy that the body can use to accelerate healthier looking skin. Ionizing product with microcurrent shows immediate hydration of the skin. Bio-Therapetic microcurrent technology was originally created over 25 years ago and is the only system on the market that is FDA approved! Routine microcurrent services can address most client requests for increased hydration and suppleness regardless of past history of photodamage or negligence. Taking this a step further, by commiting to a regular monthly microcurrent service* and by using professional products, the results can definitely help with the health of the skin and the overall aging process. 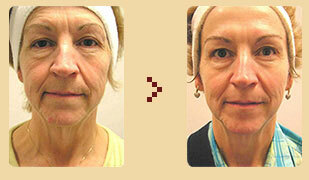 Also wonderful for maintaining results from expensive laser treatments. * Note: for special events, a single treatment can be done just before the event, without completing an initial "series". Your skin will be hydrated and "glow". *Initially a client needs to complete 6-8 visits which are bi-weekly or weekly. Initial consulltation will be more detailed and customized to your skin. Each subsequent visit allows for an increase in therapy level which enables us to gradually reach full therapeutic and maintenance levels. Once completed, monthly visits are all that's needed. Packages available for discounted pricing!